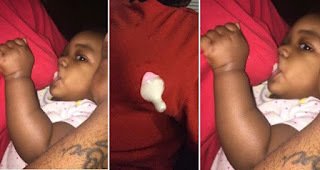 A quite creative father is currently trending online over the means he devised to feed his daughter – according to his spouse, their child is on breastfeeding and because she’s been occupied with work, her husband had to be the one taking care of the infant. In a post the husband shared on his Facebook, he narrated how he made a hole on his shirt and inserted a feeding bottle that had his baby’s food – the man has narrated how he made a hole on his shirt and inserted a feeding bottle that had his baby’s food – he tricked his baby, as she fed from it assuming she was actually feeding from her mother’s breast. He said since he doesn’t have breast and his child was disturbing, this was the only means he could come up with to distract her until her mother gets back to mama duties.